In addition to publishing across a range of high impact medical and bioethics journals, I have also created and contributed a substantial series of columns in medical ethics for several publications, most notably ASCO Post and Journal of Clinical Ethics. Full Disclosure: What Oncologists Must Tell Patients about Their Experience and Training, ASCO POST (April 10, 2019). Prosecutions of Oncologists for Health-Care Fraud Are on the Rise. Here’s What You Need to Know to Avoid Unwittingly Committing Health-Care Fraud, ASCO POST (March 10, 2019). New Regulations Require Better Communication With Patients Who Have Disabilities and Limited English Proficiency, ASCO POST (January 25, 2019). Law and Ethics in Oncology: New Laws Limiting Opioid Prescriptions Create Undue Barriers for Cancer Patients and Survivors, ASCO POST (September 25, 2018). Law and Ethics in Oncology: Expanding the Use of Provider Orders for Life Sustaining Treatment for Patients with Advanced Cancer, ASCO POST (September 10, 2018). Law and Ethics in Oncology: Why Oncologists Should Decline to Participate in the Right to Try Act, ASCO POST (Aug. 10, 2018). Law and Ethics in Oncology: Voluntarily Stopping Eating and Drinking Is a Legal and Ethical Exit Option, ASCO POST (June 25, 2018). Law and Ethics in Oncology: Decision Aids Reflect Patients’ Values and Preferences for Care. So Why Aren’t More Oncologists Using Them? ASCO POST (May 10, 2018). How to Respond to a Patient’s Discriminatory Request for a Different Clinician, ASCO POST (April 10, 2018). Legal Duties of Clinicians When Terminally Ill Patients With Cancer or Their Surrogates Insist on 'Futile' Treatment, ASCO POST (Mar. 10, 2018). Medical Aid in Dying: When Legal Safeguards Become Burdensome Obstacles, ASCO POST (Dec. 25, 2017). Informed Consent and the Oncologist: Legal Duties to Discuss Costs of Treatment, ASCO POST (Nov. 25, 2017). Legal Briefing: Stopping Non-Beneficial Life-Sustaining Treatment without Consent, 27(3) JOURNAL OF CLINICAL ETHICS 254-264 (2016) (with Kristin Kemmerling). Mandated Reporters and Compulsory Reporting Duties, 27(1) JOURNAL OF CLINICAL ETHICS 76-83 (2016). Legal Briefing: Medicare Coverage of Advance Care Planning, 26(4) JOURNAL OF CLINICAL ETHICS 361-367 (2015). 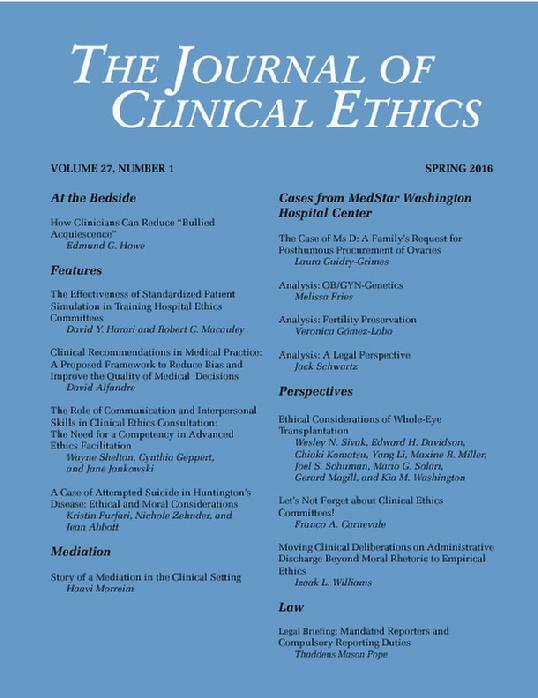 Legal Briefing: Adult Orphans and the Unbefriended: Making Medical Decisions for Unrepresented Patients without Surrogates, 26(2) JOURNAL OF CLINICAL ETHICS 180-188 (2015). Legal Briefing: Coerced Treatment and Involuntary Confinement for Contagious Disease, 26(1) JOURNAL OF CLINICAL ETHICS 73-83 (2015) (with Heather Bughman). Legal Briefing: Brain Death and Total Brain Failure, 25(3) JOURNAL OF CLINICAL ETHICS 245-257 (2014). Legal Briefing: Informed Consent in the Clinical Context, 25(2) JOURNAL OF CLINICAL ETHICS 152-174 (2014) (with Melinda Hexum). Legal Briefing: Voluntarily Stopping Eating and Drinking, 25(1) JOURNAL OF CLINICAL ETHICS 68-80 (2014) (with Amanda West). Legal Briefing: Home Birth and Midwifery, 24(3) JOURNAL OF CLINICAL ETHICS 293-308 (2013) (with Deborah Fisch). Legal Briefing: The New Patient Self Determination Act, 24(2) JOURNAL OF CLINICAL ETHICS 156-167 (2013). Legal Briefing: Shared Decision Making and Patient Decision Aids, 24(1) JOURNAL OF CLINICAL ETHICS 70-80 (2013) (with Mindy Hexum). Legal Briefing: POLST (Physician Orders for Life-Sustaining Treatment), 23(4) J. CLINICAL ETHICS 353-376 (2012) (with Mindy Hexum). Legal Briefing: The Unbefriended: Making Healthcare Decisions for Patients without Proxies (Part 1), 23(1) J. CLINICAL ETHICS 84-96 (2012) (with Tanya Sellers). Legal Briefing: The Unbefriended: Making Healthcare Decisions for Patients without Proxies (Part 2), 23(2) J. CLINICAL ETHICS 177-192 (2012) (with Tanya Sellers). Legal Briefing: Medically Futile and Non-Beneficial Treatment, 22(3) J. CLINICAL ETHICS 277-296 (Fall 2011). The Best Interest Standard: Both Guide and Limit to Medical Decision Making on Behalf of Incapacitated Patients, 22(2) J. CLINICAL ETHICS 134-38 (2011). Legal Briefing: Healthcare Ethics Committees, 22(1) J. CLINICAL ETHICS 74-93 (2011). Legal Briefing: Crisis Standards of Care, 21(4) J. CLINICAL ETHICS 358-367 (2010) (with Mitchell Palazzo). Legal Briefing: Organ Donation, 21(3) J. CLINICAL ETHICS 243-263 (2010). Legal Briefing: Conscience Clauses and Conscientious Refusal, 21(2) J. CLINICAL ETHICS 163-180 (2010). Legal Briefing: Informed Consent, 21(1) J. CLINICAL ETHICS 72-82 (2010). Legal Update, 21(1) J. CLINICAL ETHICS 83-85 (2010). Legal Briefing: Advance Care Planning, 20(4) J. CLINICAL ETHICS 289-296 (2009). Legal Briefing: Medical Futility and Assisted Suicide, 20(3) J. CLINICAL ETHICS 274-86 (2009). Legal Update, 20(3) J. CLINICAL ETHICS 287-88 (2009). Brain Death Is a Flash Point in End-of-Life Law, Ethics and Policy (August 27, 2014). New York Medical Futility Bill Highlights Wide Variation in U.S. End-of-Life Decisions Law (May 5, 2014). Death Panels: Can We Handle the Truth? (March 17, 2014). Top 10 North American Death Panels (Dec. 16, 2013). Cuthbertson v. Rasouli: Limited Guidance from the Supreme Court of Canada (Nov. 25, 2013). Stop Therapeutic Obstinacy: Penalties for Administering Futile ICU Interventions (Sept. 18, 2013). Dangerous Catholic Attack on POLST (July 19, 2013). Defending Disability Discrimination (May 31, 2013).